John Rennie will be speaking about the blockhouses here at the Cape which have been iconic structures since their construction in the late eighteenth century. Blockhouses made a re-appearance on the South African landscape during the Anglo-Boer War of 1899-1902, although the focus of the talk will be on the earlier structures. Following the first British occupation of the Cape in 1795, the existing Dutch line of defence, known as the French line, was extended by the addition of three blockhouses up the slopes of Devil’s Peak. 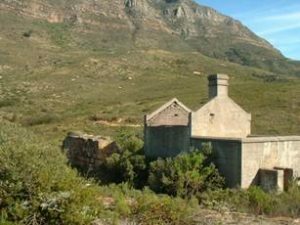 These included the Queen’s Blockhouse, on the Zonnebloem Estate, the Prince of Wales, above present-day De Waal Drive, and the King’s Blockhouse further up the mountainside. The first two have since fallen into a state of disrepair but the King’s Blockhouse, a massive stone structure 7m square, located on a prominent point on the Devil’s Peak, was retained in use as a signal station for communication between Table Bay and False Bay. The line was further strengthened in 1814 when several additional redoubts were built, and at one stage served as the official boundary between Cape Town and the country districts beyond. The King’s Blockhouse was declared a National Monument under old NMC legislation on 4 February 1938. The King’s Blockhouse is a well-known landmark on Mowbray Ridge, on the slopes of Devil’s Peak, Table Mountain. It is strategically placed to command views of Table Bay and False Bay, and combine with the York and Prince of Whales Blockhouses formed a defensive line guarding the land approach to Cape Town and Table Bay. John is a UCT graduate and former senior lecturer who has worked in general practice, with a bias towards conservation, in Cape Town and beyond. He’s been responsible for work to several important Cape homesteads as well as various city halls and the landmark Gilbert Scott Cathedral of St Michael and St George in his birthplace Grahamstown. He served as Chairman of VASSA from 1979-1980. His practice Rennie Scurr Adendorff, has acted as principal agent on major civic and state projects, such as the Cape Archives, SAHRA’s head office, the East London City Hall, The conversion of the Drill hall into the City library, Vergelegen homestead in Somerset West and the City Hall in Cape Town.